Via Page Six: Lindsay Lohan would like everyone to know that she is feeling #positive and #blessed after contracting the Chikungunya virus on vacation in French Polynesia. So what is this mosquito-borne virus that has felled our sweet LiLo in the autumn of her youth, forcing her to look on in anguish as her creepy European friends splash and play on their jet skis? The virus can be found in Africa, Asia and the Indian subcontinent. Symptoms include fever, severe joint pain, muscle pain, headache, nausea, fatigue and rash. Symptoms in infected individuals are often mild and the virus sometimes goes unrecognized or misdiagnosed in areas where dengue occurs. Most patients recover fully, but in some cases joint pain may persist for several months, or even years. There is no specific treatment, cure, or vaccine, with treatments generally focused on symptom-relief. 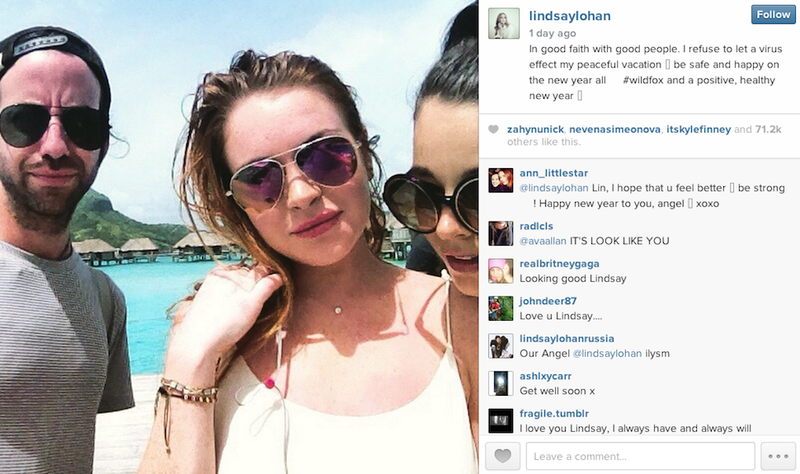 Seeing as Lindsay looks pretty not-contorted in those Instas, I'd say her chances of survival are promising. Her chances of correctly spelling "bug spray" are, sadly, 1 million to 1.